Statesmen may think that they can titrate doses of airpower in a way that they cannot do with ground combat. On August 20, 2012, President Obama placed the credibility of the United States at risk when he articulated what most considered a red line should the Syrian government use chemical weapons. Just four months later, on December 23, 2012, seven Syrians were allegedly killed in Homs by poison gas delivered by the Assad regime. Months of investigation followed; during that period, additional chemical attacks allegedly occurred in Syria on March 19th, March 24th, April 13th, and April 29th. By June, France, the United States, and the United Nations issued statements—ranging from “no doubt” to “high confidence” to “reasonable grounds”—that Bashar Al-Assad used chemical weapons to suppress his own people. Given the red line he had already expressed, President Obama began to feel pressured into a coercive military response by portions of his administration, the U.S. populace, and the international community. Two years removed from the highly successful NATO intervention in Libya conducted largely by allied airpower, many of those calls for action recommended an airpower-centric response—specifically a no-fly zone—something the U.S. “should be able to establish…relatively easily.” Politicians voiced differing conceptions of a Syrian no-fly zone, ranging from grounding of the Syrian Air Force to providing protective safe havens for the Syrian opposition or displaced refugees. The U.S. military provided recommendations for all of these, but peppered their advice with warnings of opportunity costs to other global military commitments, pessimistic intelligence assessments of robust and prolific Syrian air defenses, and degraded military readiness stemming from the imminent, arbitrary, and draconian budget cuts of sequestration. Internationally, a unified coalition to intervene in Syria did not come to fruition in 2013, and Russia’s overt support of the Assad regime complicated the intervention decision by limiting the magnitude of military force Western political leaders could realistically consider. This fear of unintended escalation founded in a reluctance to use overwhelming force ultimately encouraged President Obama to retreat from his red line and abandon notions of a Western no-fly zone. Perhaps also influenced by a pervading persistence of Powell Doctrine adherents within the U.S. military establishment, the Obama administration failed to capitalize upon the lessons learned from prior limited air-centric interventions and preserve U.S. credibility on the global stage. The Powell Doctrine asserts that should the military instrument be called upon to achieve political ends, it should be unleashed with overwhelming and destructive force. This concept influences coercive airpower theory, particularly within the foundational work of Robert Pape. Pape’s Bombing to Win moved coercive airpower theory from the nuclear to the conventional by examining large-scale use of airpower driven by primary national security objectives. However, Pape did not examine more limited engagements in pursuit of more limited aims, something airpower is uniquely suited to provide, particularly in the realm of no-fly zones. Pape’s lexicon has come to permeate military strategy, with his strategies of denial, punishment, decapitation, and risk now well-known among warfighting professionals. Of Pape’s airpower strategies, only the risk strategy falls short of full-scale military engagement that the Powell Doctrine would advise. Denial seeks to deny the adversary’s military strategy, punishment to chastise its civilian population or governing regime, and decapitation to pursue both objectives simultaneously to inspire regime overthrow. Risk strategies differ only in level of effort and scale. They inhabit a smaller, more focused segment along the continuum of violence, residing at the boundary of mere threats and force itself. Pape disparages risk strategies, calling them not-credible and claiming they are “rarely used except when coercers are subject to political constraints that prevent them from waging full-blown…campaigns.” However, the global geopolitical environment only grows more politically constrained over time, elevating Pape’s theoretical risk strategy to more relevance. The politically successful no-fly zones over Iraq from 1991-2003, Bosnia from 1993-1995, and Libya in 2011 illustrate not only the utility of employing limited airpower for limited-yet-strategic political effect, but also the need to evolve coercive airpower theory to embrace risk strategies as viable and effective. 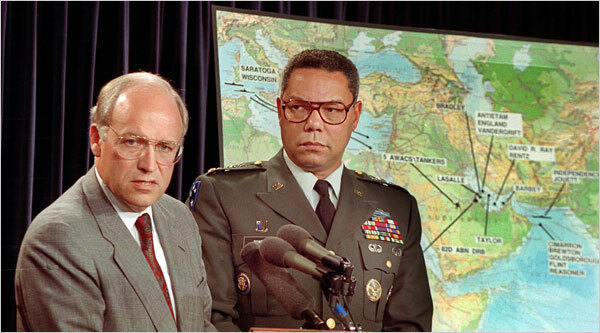 Although the Western airpower adventure over Iraq resulted in a failure of coercive diplomacy and subsequent ground force invasion, the two no-fly zones over the rogue state succeeded in adapting to multiple and shifting political objectives across multiple U.S. presidential administrations. Better described as air exclusion zones, Operations Northern and Southern Watch were created initially to protect Iraqi civilians in the north and to contain the Hussein regime in the south. Over time, each successfully shifted their emphasis to regime punishment as an element of coercive diplomacy, to counter-weapons of mass destruction and inspection enforcement, and ultimately to sovereignty erosion and overt regime change. The Western coalition accomplished these objectives across a 12-year span, using extensive force structure, but well below overwhelming levels of force. The West’s military strategy mirrored its shifting political guidance, featuring first an initial denial strategy emphasizing integrated air defense system and command and control targets both for political expediency and force protection, expanding later to incorporate denial targets such as counter-force ground elements, counter-weapons of mass destruction, and ultimately regime punishment, dual-use targets. Levels of force applied approached meaningful levels only during Desert Fox in December 1998, and as a prelude to invasion in late 2002. Despite costs of upwards of $1 billion per year to the U.S. government, the loss of some post-Desert Storm credibility due to limited expressions of force, and the time necessary to capture actionable lessons learned for the next Western air-centric interventions, the first no-fly zone attempts to employ limited airpower assets to achieve limited strategic objectives were successful. The air exclusion zone over Bosnia began as those over Iraq were still in full-force, again instituted for primarily humanitarian concerns, but Western interventionists and NATO had learned from the Iraqi experience. Once the UN and NATO committed to intervention in the form of Operation Deny Flight on April 12, 1993, the no-fly zone quickly acquired the necessary political authorizations via multiple UN Security Council resolutions to become a full-fledged air exclusion zone in less than two months. By comparison, similar authorities in Iraq took over three years to develop, and then only the southern air exclusion zone benefited. However, UN desire to remain impartial during the Bosnian intervention restricted the application of allied airpower to levels far below credible. Airstrikes conducted during Deny Flight were within the denial category, but they were executed in a reactionary rather than proactive manner. Despite adequate political authorizations for a more aggressive and forceful application of airpower, the coalition remained reluctant to leverage them until the atrocities of Srebrenica in 1995. Only after repeated failures of NATO airpower to protect UN peacekeepers and Bosnian civilians did the Western nations employ levels of coercive force already authorized by existing political guidance. This elevated expression of force took the form of Operation Deliberate Force, a 22-day airpower surge beginning on August 30, 1995. Militarily, Operation Deliberate Force achieved its objectives in just three weeks (i.e., the cessation of Bosnian Serb hostilities against safe areas, the withdrawal of heavy weapons from around Sarajevo, and the restoration of the flow of humanitarian aid). The persistent and credible application of airpower executed via an incremental risk strategy during diplomatic efforts represented a stark departure from the previous 28 months of Operation Deny Flight’s reactionary denial strategy, and the air exclusion zone also compelled the combatants to pursue a longer-lasting peace. The entirety of Operation Deliberate Force represented a busy, single day in Operation Desert Storm, and the just over 1,000 weapons delivered in Deliberate Force represented a tiny fraction of the 227,340 weapons expended against the Iraqis in the 43 days of Desert Storm. Again, an extremely limited air-centric force had achieved significant strategic and life-saving effect via an eventually effective risk strategy. NATO’s first-ever foray into an African conflict represented the most evolved application of an air exclusion zone to-date. Operations Odyssey Dawn and Unified Protector comprised just seven months’ time and benefited from clear and unchanging political and military objectives. UN Security Council Resolution 1973’s triumvirate of political goals—executed primarily by NATO airpower—guided and bound the operation from inception to conclusion: protect Libyan civilians from harm, monitor and enforce an arms embargo, and enforce a no-fly zone. Unlike prior iterations of no-fly zones, the Libyan version began as a true air exclusion zone with authority to strike ground targets from day one. NATO and participating partner nations achieved their military objectives quickly within a risk-based strategy of denial and limited regime punishment with coalition military leaders successfully convincing their civilian masters that integrated air defense system degradation or destruction should accompany the establishment of an air exclusion zone. Of all the no-fly zones attempted, Operations Odyssey Dawn and Unified Protector employed the smallest force structure and did so across daunting distances. Capacity challenges drove coalition innovations in collection, dynamic and deliberate targeting, and the command and control architecture, all contributing to the success of the operations. With approximately 45 strike and support aircraft to start, growing to about 90 at the height of engagement, Unified Protector’s modest daily sortie production rate of approximately 120 represented an almost order-of-magnitude decrease from the 1,000 sortie per day surges of Operation Southern Watch, and another order-of-magnitude reduction from Operation Desert Storm’s 42,000+ daily strike sorties influenced by the Powell Doctrine, illustrating that limited means can be credibly matched to limited strategic objectives. Such applications of limited force epitomize an airpower risk strategy, and while some might claim that military capacity decisions in Libya may have lengthened the conflict, achieving the UN Security Council resolution mandates in just seven months’ time and with sufficient speed to save tens of thousands of Libyan civilians must be deemed a success, even if the long-term stability of Libya remains ambiguous today. The universe of no-fly zones, or air exclusion zones, illustrate that risk strategies of limited, incrementally applied military force, particularly from the air, can achieve strategic political outcomes. All three cases featured denial-based strategies, and those over Iraq and to a lesser degree Libya also contained regime punishment elements. There is nothing to prevent the claim that no-fly zones can effectively pursue denial, punishment, or decapitation targets as part of a limited force risk strategy. Air exclusion zones can achieve political mandates short of war in a matter of months, and they benefit from swift applications of force delivered in credible magnitudes, ideally in parallel with other coercive instruments. The three case studies demonstrate modern no-fly zones offer the political and military flexibility to modulate force precisely in levels far below overwhelming, within a risk-based strategy of coercive diplomacy, to achieve limited but strategic outcomes. This claim does not yet exist in coercive airpower theory, and it is time for practitioners and students of warfare to embrace the viability of titrating military force—especially airpower in the form of an air exclusion zone—to achieve limited and coercive ends. Although the no-fly zones over Iraq resulted in coercive failure, Bosnia’s yielded coercive success, and Libya’s were not executed for coercive means, each iteration employed more refined force structure to achieve limited but strategic outcomes. An air exclusion zone near or over Syria in 2013 would have likely helped coerce Assad to abandon chemical weapons use and at the very least preserved U.S. credibility. Whether to protect opposition forces, ground the Syrian Air Force, ensure the flow of humanitarian aid, or all three objectives in concert with other instruments of national power, a Syrian air exclusion zone might have employed limited air-centric assets to achieve limited-yet-strategic political effect. Such an intervention would have raised the stakes for the U.S. and the West in a very complex and amorphous situation, but given the many Russian breaches of sovereignty and adventurism that have since transpired, preservation of U.S. credibility in this instance may have been the prudent course. Tom Torkelson currently serves as an adjunct professor of military and strategic studies at the United States Air Force Academy. The views expressed in this article are the author’s alone, and do not reflect the official position of the U.S. Air Force, the Department of Defense, or the U.S. Government. Have a response or an idea for your own article? Follow the logo below, and you too can contribute to The Bridge. Thomas A. Keaney and Eliot A. Cohen, Revolution in Warfare? Airpower in the Persian Gulf (Annapolis, MD: Naval Institute Press, 1995), 213. “We have been very clear to the Assad regime…a red line for us is we start seeing a whole bunch of chemical weapons moving around or being utilized. That would change my calculus. That would change my equation…that would change my calculations significantly.” From the White House, Office of the Press Secretary. “Remarks by the President to the White House Press Corps,” August 20, 2012. https://obamawhitehouse.archives.gov/the-press-office/2012/08/20/remarks-president-white-house-press-corps, accessed August 21, 2017. Arms Control Association, “Timeline of Syrian Chemical Weapons Activity, 2012-2017,” June 2017. https://www.armscontrol.org/factsheets/Timeline-of-Syrian-Chemical-Weapons-Activity, accessed August 22, 2017. Arms Control Association, “Timeline of Syrian Chemical Weapons Activity, 2012-2017,” June 2017. Burgess Everett, “McCain, Graham call for no-fly zone,” Politico.com, June 13, 2013. http://www.politico.com/story/2013/06/syria-no-fly-zone-092766, accessed August 22, 2017. General Martin E. Dempsey, Letter to Chairman of the U.S. Senate Armed Services Committee, the Honorable Carl Levin (July 19, 2013), 2. See also, Combat Plans Division/Master Air Attack Plan Staff Estimate: Syria No-Fly Zone. 603rd Air Operations Center (Feb 7, 2012). Classified Secret, cited portions unclassified. Pape, Bombing to Win, 28, 320. See Brig. Gen. David A. Deptula, “Air Exclusion Zones: An Instrument of Engagement for a New Era,” Airpower and Joint Forces: The Proceedings of a Conference Held in Canberra by the Royal Australian Air Force (RAAF Fairbairn, Australia: Aerospace Center, 8-9 May 2000) for an in-depth exposition on the more-accurate term AEZ. See Karl P. Mueller, (ed. ), Precision and Purpose: Airpower in the Libyan Civil War (Santa Monica, CA: RAND Corporation, 2015), 4. Newer PostThe Office of the Secretary of Defense and the Joint Chiefs: An Unequal Dialogue in Which Direction?